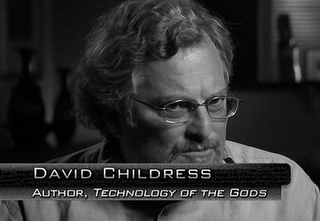 David Childress on "Ancient Aliens." David Childress (formerly David Hatcher Childress) was born in France in 1957 and raised in the Western United States. He acquired an interest in archaeology as a teenager but dropped out of the University of Montana after a year and did not complete his degree. He began traveling the world to visit “mysterious” sites. In 1983, the year of his first published book, he joined a New Age commune in Stelle, Illinois then run by Richard Kieninger, a pyramid mystery-monger and guru who taught his followers that the world would end on May 5, 2000. The commune, an offshoot of the nearby Lemurian Fellowship commune, believed Christ was king of Atlantis and saw the New Age as the fulfillment of the Millennium, themes that manifested in Childress’s various books. Childress’s first book, a third-world travel guide from the Chicago Review, was his only professionally published volume. In 1984, he founded Adventures Unlimited Press to publish all of his subsequent books, which were largely pastiches of earlier authors’ alternative history tomes and mystical material from the Lemurian Fellowship, containing little original thought and increasing amounts of material summarized, paraphrased, or directly copied (with and without attribution) from others’ books. Childress expanded his book line to include reprints of many of the books he used as sources for his own. In 1998, DeWayne B. Johnson sued Childress after Childress republished Johnson’s 1950 master’s thesis on UFOs without the author’s permission. Childress settled out of court, paid Johnson a significant sum, and withdrew Flying Saucers over Los Angeles from publication. A 1996 libel suit against Childress was tossed out of court because the statute of limitations had expired. Childress has become a frequent television presence, appearing in documentaries on NBC and most major cable channels. Beginning in 2009, he became one of the regular talking heads on Ancient Aliens, rhapsodizing about the forthcoming alien apocalypse. Childress does not hold any degree and claims no credentials or expertise on any subject. Prior to 2009: Major lost world civilizations, such as Atlantis, “Osiris,” and “Rama,” were destroyed by a major cataclysm, probably involving atomic weapons. These civilizations were technologically advanced. After 2009: Extraterrestrials were responsible for ancient civilization and monuments, and the aliens will return to rapture the faithful to a trans-dimensional heaven in the New Age. Childress’s position on ancient mysteries has fluctuated in parallel with his financial interests. From 1983 to 1993 Childress was a “lost civilization scholar,” claiming that a series of Atlantis-like civilizations ruled the ancient earth. But with the publication of Extraterrestrial Archaeology, an ancient astronaut book, he became an ancient astronaut theorist from 1994 to 1998. After the Johnson lawsuit, he backed away from UFOs and aliens. From 1998 to 2000, Childress preferred time travel as the origin of anomalous ancient civilizations. 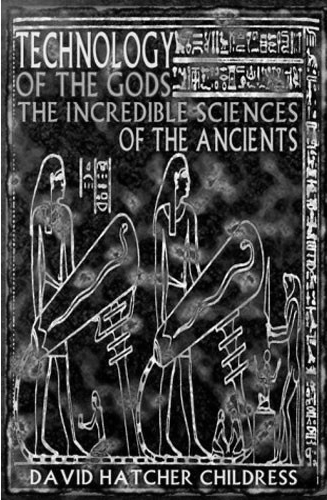 In 2000, he returned to lost civilizations with his Technology of the Gods, though he also released a new edition of Extraterrestrial Archaeology. In 2007, he warmed to the ancient astronaut theory again for a book on the Olmec, and in 2009 he became a pundit on Ancient Aliens. Childress described Erich von Däniken in print as a “fraud” and ancient astronaut evidence as fictitious before reversing himself and his printed views in order to appear on Ancient Aliens. Childress described himself as an “archaeologist” in online videos made to promote his books despite possessing no credentials. Childress settled a lawsuit claiming he republished a master’s thesis without its author’s permission. Childress recycles text from book to book, repeating not just ideas but thousands of words of exact wording while selling each book as a completely new work. Childress does not offer original ideas in his books but instead collects the ideas of others and repeats them, sometimes verbatim, without original analysis or commentary.